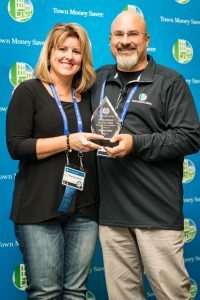 CUYAHOGA FALLS, Ohio – Local advertising franchise Town Money Saver (TMS) recently recognized a few of its elite franchisees during its 25th annual meeting at the Sheraton Suites in Cuyahoga Falls. TMS franchisees Stacey Carter, Jeff Ulery, and Mark Goehler all took home Regional Franchisee of the Year honors during the meeting. Carter was named 2018 Company-wide Franchisee of the Year. Stacey Carter poses with TMS President Bill Zirzow after being named TMS Franchisee of the Year. To be named a franchisee of the year, the winner should exemplify the “ideal representation” of the company, according to TMS’s guidelines. Carter operates in eight communities throughout Northwest Ohio and Michigan. In addition to be named Franchisee of the Year, Carter also earned a regional award for Most Improved Market in Northwest Toledo. “Work hard and be focused,” Carter said about being successful in advertising. “Always appreciate your customers and do your best to provide them with good products. Ulery was recognized as Regional Franchisee of the Year for Central & Southern Ohio and Kentucky. He operates in 10 communities in the Columbus area and in Mansfield. Jeff Ulery addresses the company during TMS’s 25th Annual Meeting. “It’s an honor to be named a franchisee of the year, especially since TMS is a 25-year-old organization with lots of great people,” he said. Ulery also earned TMS’s Leadership Award, which is given to a franchisee who displays knowledge of the business, initiative, decision-making skills, flexibility, creativity, motivation, and confidence. For Goehler, the award allows him to gauge his performance compared to his peers. “It’s always nice to be recognized for all your hard work,” he said. Mark Goehler, left, poses with TMS President Bill Zirzow during Town Money Saver’s 25th Annual Meeting. 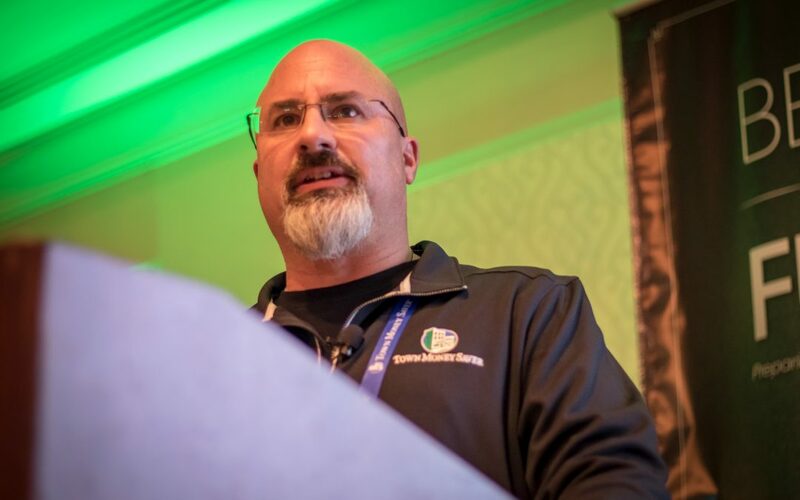 This is the third time Goehler, who operates in 10 communities in the Northeast Ohio region, has won the regional honor. He was named Company-Wide Franchisee of the Year in 2015. During the meeting, Goehler also was recognized for having been with TMS since its inception in 1992. 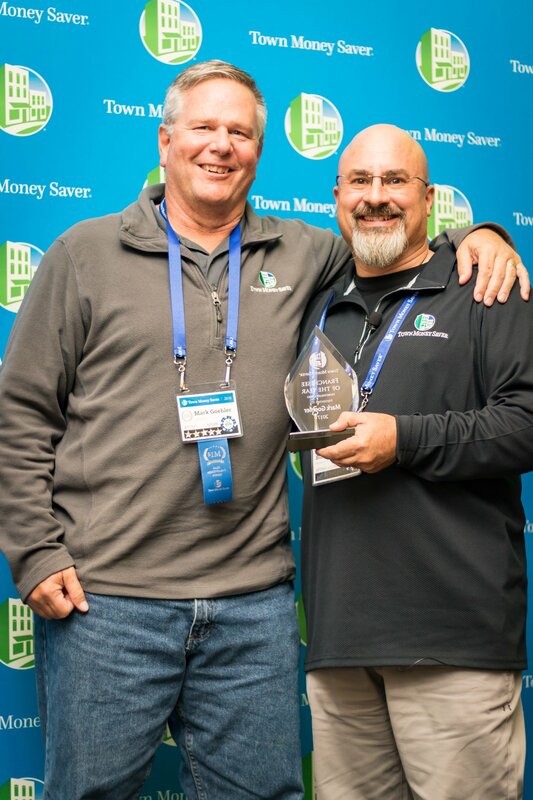 “First off, Town Money Saver was really Mark’s idea, which was born because of his passion at his previous job,” Zirzow said. “And at the riskiest moment, he chose to come on board. 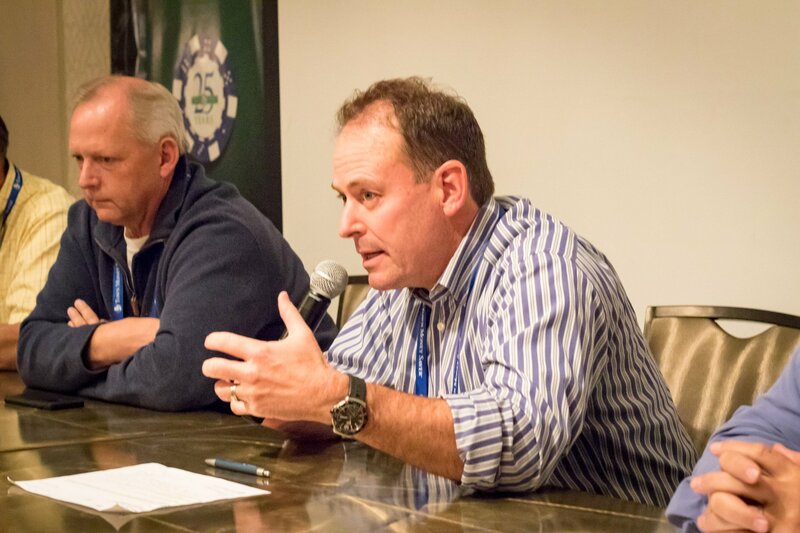 Being part of the foundation of Town Money Saver, Goehler offered advice to young entrepreneurs. Other award winners included Dustin Montgomery, who won the Blane Drake Award for demonstrating selflessness both professionally and personally; and Alan Appel, who was recognized as Rookie of the Year.